Here are some diagram showing how to wire up a hot tub with a 220 volt GFCI breaker. This type of breaker is designed to protect you from voltage leaks in wet environments. It will automatically cut off the power if the electricity gets in contact with the water. 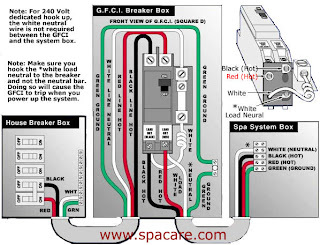 The first diagram shows the GFCI breaker installed in the main service panel. This way will protect the entire line from the panel to the hot tube but is a longer walk to reset. The second shows the GFCI breaker in the disconnect next to the hot tub. This is much easier to reset but doesn't protect the whole line. Extraordinarily enlightening many thanks, I'm sure your readers could quite possibly want significantly more stories similar to this carry on the good effort. Hot up wiring of the state of the best essay which is renowned for the constitution. It is the remembered place for the legal and all documentations for the independent state of the america. It is the valuable place and territory. Check with the manufacturer for any warranty coverage for your new cover. It is an essential accessory to protect your tub and warranty will certainly provide you with a peace of mind later should any problem arise. Line/Load on a GFCI outlet.